Better known as “Amp” by his teammates, played in 13 games and started 12…finished with 24 tackles (16 unassisted) and one tackle for loss…recorded three or more tackles in seven of his 13 games played…registered his only sack of the season versus NC State…helped Florida State’s defense lead the nation in yards allowed per play (3.86), rank second nationally in total defense (254.14 ypg) and rank in the top six nationally in scoring defense (14.71 ppg), rushing defense (92.29 ypg), pass defense (161.86 ypg), pass efficiency defense (95.43) and opponent three-and-outs (6.29 per game)…his ability to help shut down the run (FSU allowed 2.75 yards per rush) and command extra attention in the middle helped free up FSU’s standout defensive end duo of Bjoern Werner and Tank Carradine…missed the season-opener and a start versus Savannah State due to injury… co-recipient of the Unselfish Leadership Award on defense given at the team’s annual banquet. Redshirt junior defensive tackle as a second-year starter in the middle of the Seminoles’ defensive attack…started 11 of the 13 games he played and was instrumental in FSU finishing as the No. 2 rushing defense in the country…also helped the Seminoles rank first nationally in yards allowed per rush (2.35)…tied for second among all interior defensive linemen registering 25 tackles, including 14 solo stops while adding five tackles for loss which ranked second among the interior linemen…also logged two sacks, a pass break-up, a quarterback hurry and a forced fumble…became one of four Seminoles to earn ACC Defensive Lineman of the Week honors, when he posted a season-high five tackles, including a tackle for loss, and forced a fumble against Boston College…recognized with one of two leadership awards for the defense at the team’s annual banquet. A redshirt sophomore who arrived at FSU in January 2010 from Itawamba (Miss.) Community College and became a mainstay in the starting lineup throughout the second half of the season…a defensive tackle who played his high school football 45 minutes from the FSU campus in Thomasville, Ga…appeared in all 14 games and started the last seven…McCloud burst on the scene in the opener against Samford with six tackles to lead the Seminoles defensively…contributed 35 tackles, including 3.0 tackles for loss and one sack, which came against BYU…tallied five tackles against Clemson…had four solo tackles in two games (Samford, Clemson)…matched his career-high with six tackles against South Carolina in the Chick-fil-A Bowl. 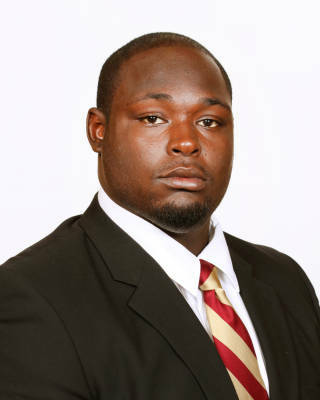 Signed with FSU as a member of the 2008 class…as a freshman defensive tackle at Itawamba (Miss.) Community College in 2008, registered 24 tackles (20 solos) with 5.5 tackles for loss, including four sacks…the Indians ranked sixth nationally in rushing defense (86.7 ypg), despite a 3-6 finish…sat out the 2009 season as a redshirt…ranked as the nation’s No. 78 prospect by Allen Wallace among SuperPrep JUCO 100…Thomasville Times-Enterprise’s Defensive Player of the Year for 2007…his Thomas County Central team won its first 13 games in 2007 before losing in the class AAAA semifinal…born August 6, 1989.